Performing a fusion of Motown Soul Classics with a mix of modern soul and original material. 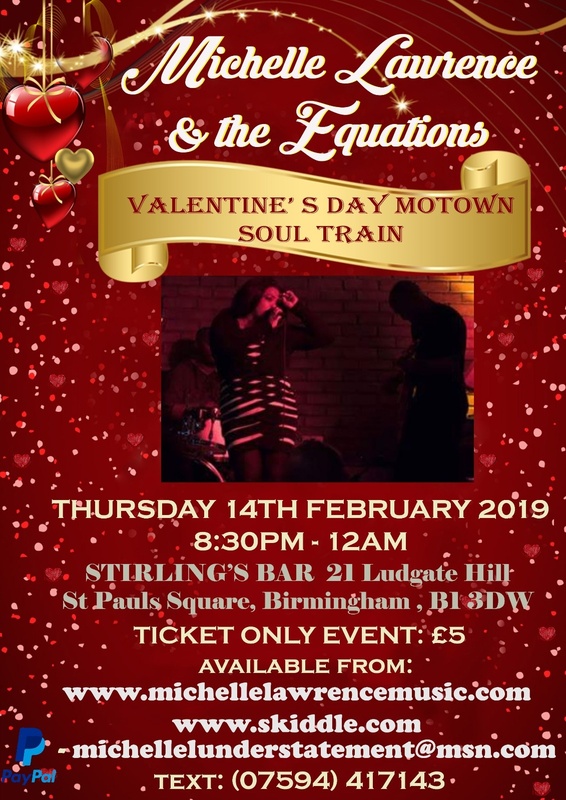 If your looking for a great night out this Valentines then join us, we will be performing an exclusive set on Thursday 14th February, Showtime 8.30pm @ Sterling Bar, Ludgate Hill, Birmingham, B3 1DW. 'Michelle Lawrence and The Equations' was founded by Michelle Lawrence. The band consists of: a Drummer, Lead Guitarist, Keyboardist, Bass Guitarist and a Lead Singer. 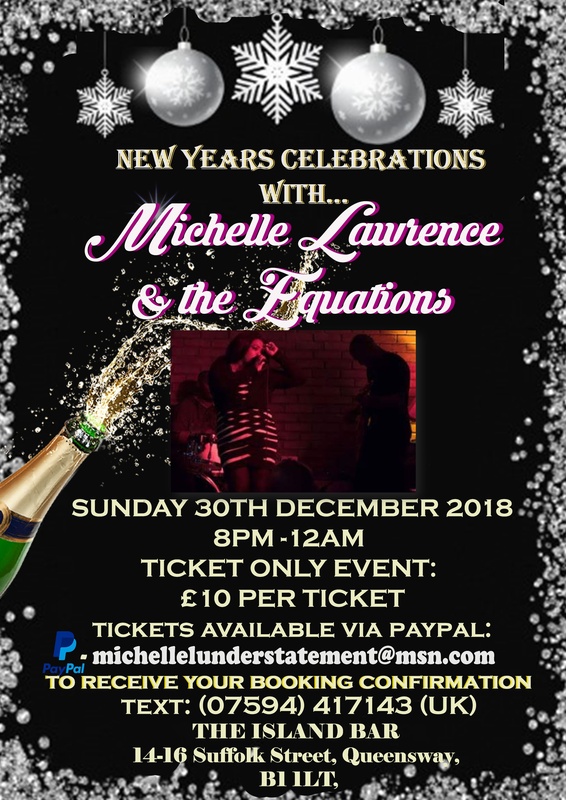 Together ‘Michelle Lawrence and The Equations’ perform a beautiful fusion of Motown Soul Classics with a mix of modern soul and original material. The band’s favourite quotation is: ‘There's never a dull moment when we are together on stage’. 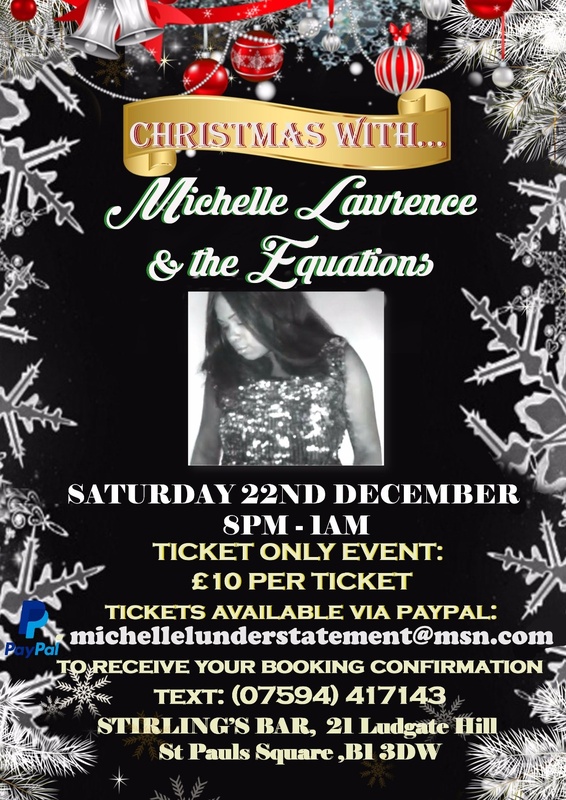 If you like Motown and Soul music and you are looking for a great night out.. you will love 'Michelle Lawrence and The Equations'..
Michelle Lawrence has also written an album called 'I'm Not Invisible' and has a video of one of her album songs that is called 'Right Now' additional song releases are called ‘Ain’t Gonna Rain’ and ‘Running Away’.. Available now at Itunes. ‘Michelle Lawrence and The Equations’ will be recording some songs together for release later this year.. for further details please also visit: www.michellelawrencemusic.com to request updates through the Michelle Lawrence mailing list.